Our experience in the commercial sector offers clients confidence that we are seeking to provide value to their investment as part of our design work. Having been involved in a number of commercial projects we have an understanding of the considerations that need to be made to allow work spaces to efficient and safe for its users. 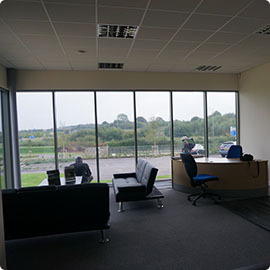 We have designed new offices and helped alter internal layouts to existing commercial units to suit the requirements of the client. We consider the building’s stability and offer cost effective solutions to incorporate the proposals.